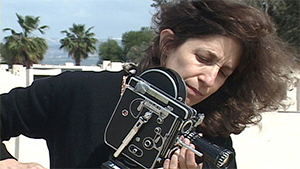 Lynne Sachs had been painting and writing poetry for years when, in 1983, she began to make films, in particular documentaries, often with an unconventional, experimental approach. As she explains, her films "explore the intricate relationship between personal memories and broader, historical experiences." She has made nineteen films and videos over the last twenty-five years and is at work on a new documentary today. Sachs has described her provocative filmmaking style as follows: "In my art work, I try to expose the limitations of verbal language by complementing it with complex emotional and visual imagery. My experimental documentary films push the borders between genres, discourses, radicalized identities, psychic states and nations." "I begin my films by immersing myself in a community, asking questions and listening. With SERMONS AND SACRED PICTURES (1989), I returned to my hometown of Memphis, Tennessee in order to piece together a portrait of a person whose historic identity seemed to be tumbling into oblivion. I listened to eleven people as they explored their almost forgotten pool of memories of Reverend L.O. Taylor, an African-American minister who made films in the 1930's and '40s." "In 2001, I completed INVESTIGATION OF A FLAME, an experimental documentary portrait of the Catonsville Nine, a disparate band of Vietnam War protesters who chose to break the law in a defiant, poetic act of civil disobedience." Investigation of a Flame - An intimate look at the Catonsville Nine who on May 17, 1968 walked into a Catonsville, Maryland draft board office, grabbed hundreds of selective service records and incinerated them with homemade napalm. The Last Happy Day - A portrait of a doctor who saw the worst of society and ran. Sermons and Sacred Pictures - Profiles Reverend L.O. Taylor, a Baptist minister and inspired photographer/filmmaker who documented the fabric of black American life prior to the civil rights movement. States of Belonging - The core of this haunting meditation on war, land, the Bible, and filmmaking is a portrait of Revital Ohayon, an Israeli filmmaker and mother killed near the West Bank. Which Way Is East - When two American sisters travel north from Ho Chi Minh City to Hanoi, conversations with Vietnamese strangers and friends reveal to them the flip side of a shared history.